Ingredients for 4 people: 500 g of brocrol,i; 500 g of bread, a dar or two old; 100 g of guancia (pig’s cheek); Laudemio; 2 glasses of tornato purée; 1 glass of stock; parmesan; onion. Chop up the onionand the guancia together; jet them take colour in a pan. Add the broccoli, which you have previously washed and cut up. Sprinkle on some salt and pepper, and gradually add the stock and tornato purée. Leave the broccoli to simmer in this mixture for about 90 minutes. In the meantime, cut the bread into slices 2cm thick and toast them. Take a soup dish and lay some slices of bread out in it. Cover these with broccoli, Parmesan cheese and a splash of Laudemio. 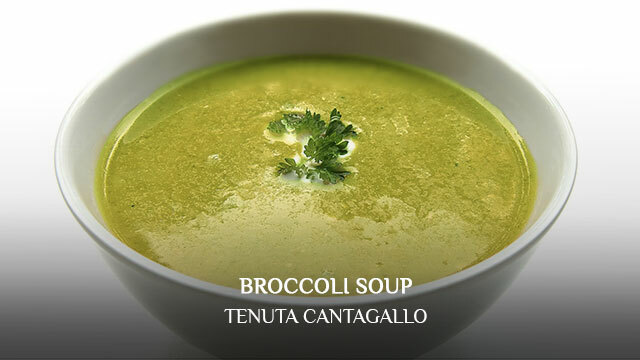 Continue with another layer of bread and another layer of broccoli, cheese and oil until you reach the top of the soup dish. Cover the dish and leave it to stand for 15 minutes. Serve.